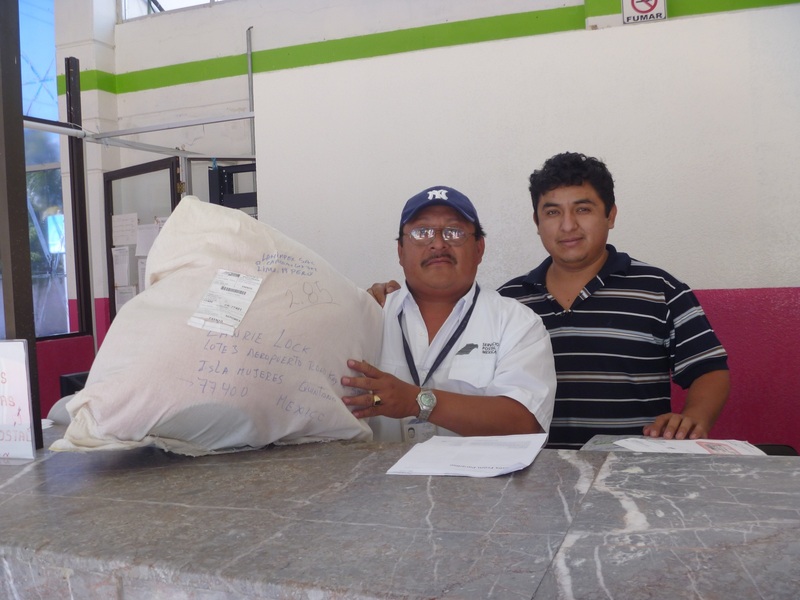 Many of our island friends are amazed at the things that we receive via the Mexican postal service. We seem to be one of the only houses to have mail regularly delivered to our door. We had been told; don’t use the mail, things will get lost, or stolen, or just disappear. Part of the problem is the lack of visible addresses, or even a consistent method of assigning house numbers. Our address is actually Lote 3 on Aeropuerto Prolong, but my neighbour one lot to the south is Lote 11 on an entirely different road. What? Addresses are so difficult to figure out that bank, water, electrical, cable and telephone statements are independently delivered by couriers hired by the individual companies. 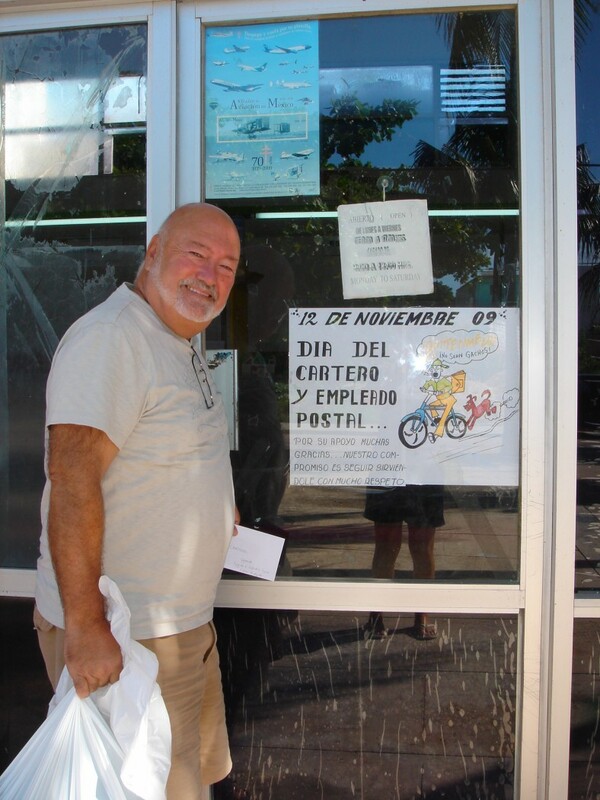 ﻿ Back in November 2008 when we arrived on Isla to live fulltime we noticed that there was a greeting card in our “buzon” mail box. It was from a dear friend in Keremeos BC Canada who had addressed the card simply as Lawrie and Lynda Lock, K’aay Ha, Isla Mujeres, Mexico. She had mailed it on October 31st and it was waiting for us on November 9th. Not bad! ﻿﻿Lawrie and I had a good chuckle over that and never thought about it again. Then two weeks later a small packet from another friend Penticton BC arrived – a new calendar for 2009 and a personal note to us. Interesting! Shortly after that our accountant in Penticton BC sent down a packet of mail from our Canadian post box. Maybe we could use the mail service after all. Andreas making a delivery to our casa. ﻿To put that theory to the test Lawrie proceeded to order a variety of things over the internet from the US, Canada and even China: a case of special engine oil for our Nissan Altima 0/20 weight, 20 yards of Navy Sunbrella and 13 yards of Blue Sky Sunbrella fabric to re-cover our deck furniture, a new Sirius Satellite radio, Sony E-Book, Maui Jim replacement sunglasses, replacement tail light component for the Nissan, medications, Halloween costumes, two Kindle E-Books, clothes for both us, and most recently a box of Pickapeppa Sauces. ﻿﻿﻿ Sometimes the postal delivery person arrives on his motor-scooter with the parcel and the large hard covered binder that we sign to confirm the delivery. Or on occasion, as in when we received the Sunbrella fabric, he delivered the 5-foot long roll in a taxi! 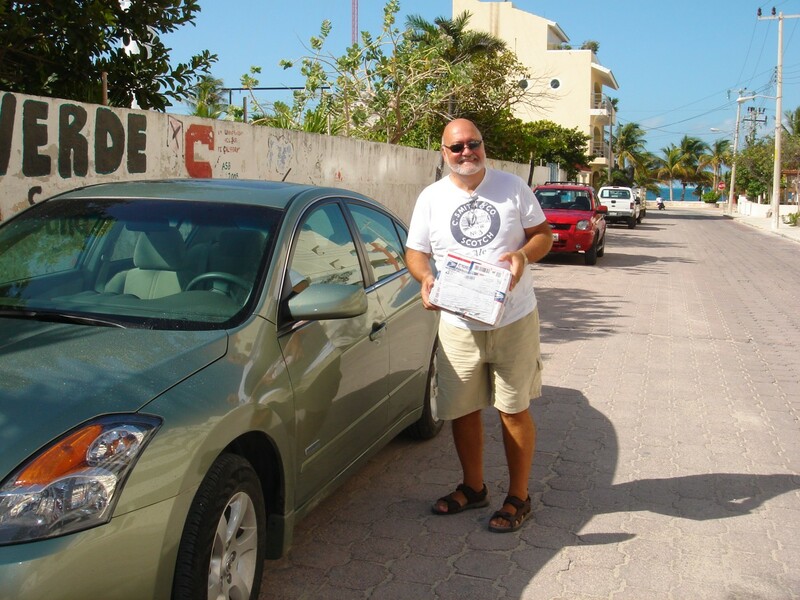 When Lawrie and I took the Maui Jim sunglasses to the post office and arranged from them to be mailed to Mexico City for warranty work a few hours later the door bell rang. The smiling postal worker was there with our package and his receipt book asking if we wanted it sent by air instead of ground delivery. Apparently he was new to the office and had not asked that question when he charged us 54 pesos. For another 40 pesos we had it changed to air delivery, got a receipt, and away he went back to work. We love these guys! We have been so successful with our mail deliveries we have offered the use of our address to several inland-gringo friends. I can just see it now – a small warehouse set up in our laundry room with a series of shelves, numbered slots, and a spot for the recipient’s name. ﻿﻿Maybe we should get jazzy uniforms for Lawrie and I to wear. 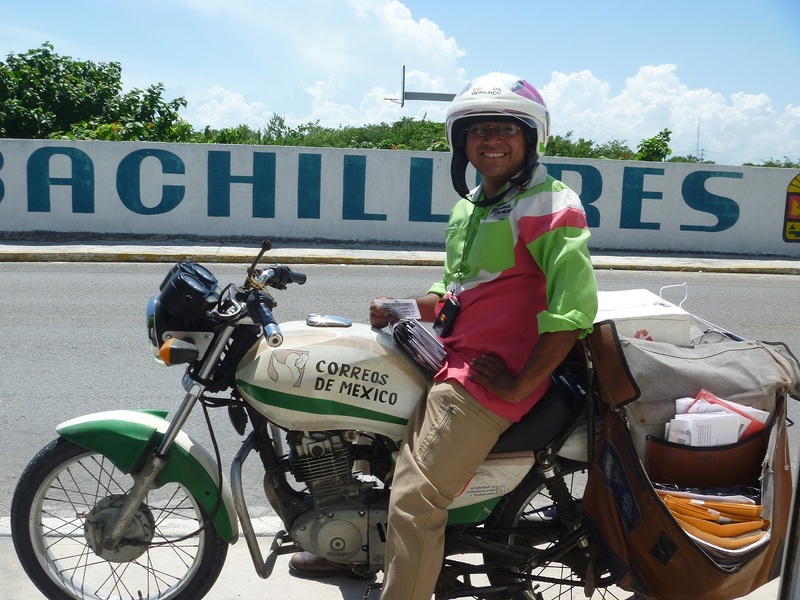 Perhaps something in attractive Caribbean blues and greens with Gringo Couriers or Gringo Mail Service embroidered on the pockets? And, because we get such great service we never forget to take the posties their treats on November 12th – Mexican National Postal Workers’ Appreciation Day. Enjoying reading your blog Lynda – as an “Isla-holic” any news about the island is greatly appreciated. Lucky you on the great postal service! Nice style, format & content. Ok, I'm going to order something just for the heck of it. You've given me confidence, thanks! 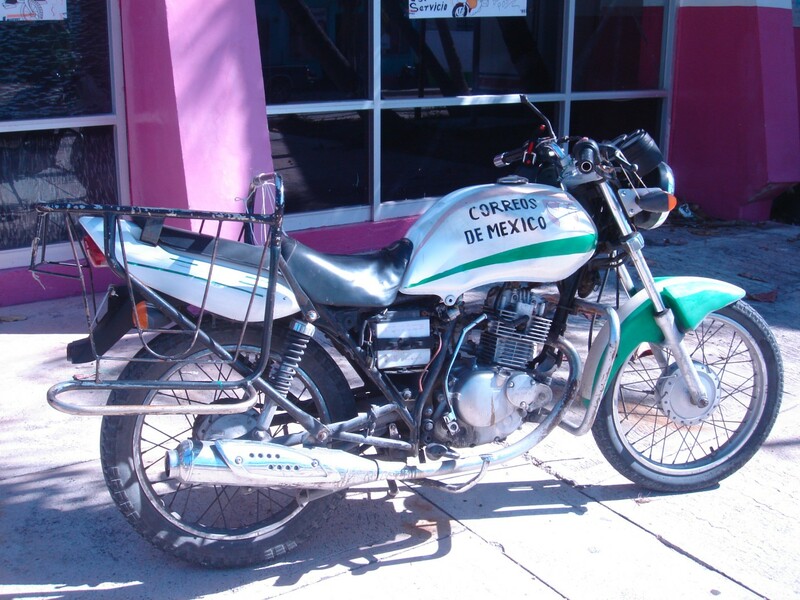 Do you know a person to contact regarding info on waste disposal in isle mujeres?